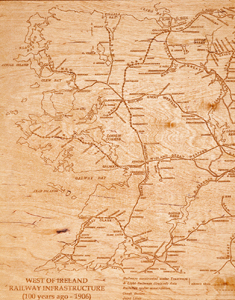 Following the arrival of railways in c.1840 Ireland developed a very detailed railway infrastructure and network that spread into all 32 counties over the following c. 60 years. For example County Donegal, now without a single operating railway (apart from a 3-mile ‘tourist’ line! ), had no less than three different railway lines systems with stations in most large and small towns and villages in the early 1900’s – then bringing the convenience of such transport to over 90% of the county’s population. Many other counties had similarly good railway networks at that time. 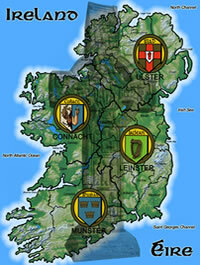 However, by the mid 1900′s much of Ireland’s rail network, particularly in the rural areas, no longer operated. County Donegal’s last train ran in 1958. Sadly, much of the human traffic carried by these trains carried our native people to the various Irish ports – to board the emigrant ship to UK, USA and various other far-off lands…many never again to return. Today, all that remains of our once proud railway network in many parts of Ireland are the traces of where trains once traversed. Olde Ireland’s ‘Old Irish Railways’ shows Ireland’s extensive railway network in its heyday in 1906. 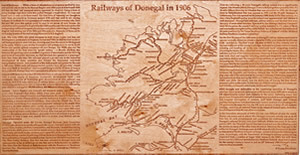 Laser engraved onto old roof slates, onto various old hardwoods, onto cork tiles or on a variety of other materials and completed as one map or enlarged to any size in ’tile’ format, these laser engravings make for a unique and beautiful gift or keepsake – for a variety of occasions or purposes.